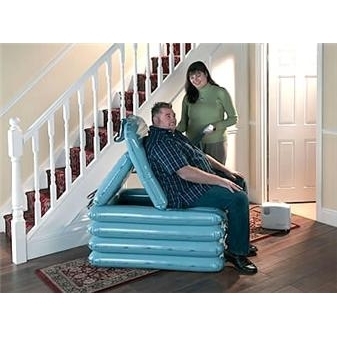 Suitable for any age, especially very large or bariatric people (lifts up to 50 stone/320kg). Portable, packs away into a compact and discreet bag. Lifts up to 320kg (50 stone). Deflated rolled dimensions 76cm length x 20cm diameter. The unique Camel inflatable lifting chair is designed to sit up and lift a fallen person safely and with dignity from the floor. It minimises moving and handling risks and helps to protect the person assisting from strain or injury. The Camel is operated by low air pressure using the Airflo power source and can be used anywhere indoors or outside.